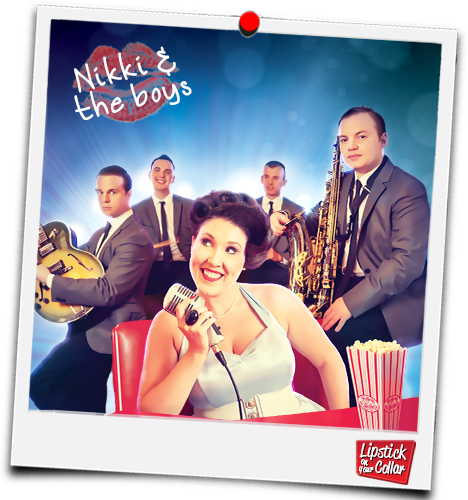 We are Lipstick On Your Collar, an exciting 50's/60's Show specialising in bringing the Classic Pops hits from the Golden Era of music back to life, with soaring vocals, tight harmonies and an infectious sense of fun! We'd love to keep in touch with you, so to be kept up to date with show news, live photos and much much more, give our Facebook page a Like using the button below. In the mean time though, feel free to lean back, kick of your shoes and take a wander round the site. There are demos on the Jukebox, photos in the Gallery and a video to watch if you visit the Flicks! Make yourself at home and hopefully we'll be seeing you in the flesh in the not too far distant future!